Home › Uncategorized › I’m Officially A Dad!!! Hari Raya came and gone. Did not meet my initial visiting targets but I guess people understood the situation I was in, what with Aida and her constant contractions. This bundle of joy would certainly complete us. When I said the baby would complete us, an old friend teased me and told us not to stop at one. I said no, the baby would complete us, but her siblings would enhance us further. I think all parents share that sentiment. Exciting times lie ahead!!! Those of you who were born before the 90s would always look forward to children-related shows like Aksi Mat Yoyo, Hari Raya shows, Tok Selampit and what-nots back then and wished you were in the shows yourselves right??? Well yours truly also felt that way too. In fact I went to the Bengkel Kanak Kanak auditions back in 1983 but did not make the grade, probably since I was marked by the producers for running round the building. Yes I was very inquisitive to know what went on in the old Singapore Broadcasting Corporation building. As a boy growing up and hormones raging, I have to admit that I had a few crushes on some of the Bengkel gals. Heck I even ended up marrying one (though I only knew my wife was in it when I went through her old albums…)!!! Talk of irony… But no, my wife was not as popular as some of the others as she only appeared on TV once. Since my primary school days, I’ve managed to make friends with a few of them who I am still in contact with. Fast forward to the current time, I recently got to know one of the guys (Del Rasouli) who was in the 1988 batch as my wife. He and me are currently undergoing our IPPT Preparatory Training at Bedok Camp and he told me of an alumni being created for the ex-Bengkel Kanak-Kanak members. I wasted no time contacting those in my list of contacts who used to be a part of the “elite” group and sourcing out on my own the names of those who I could still remember back in those days on the Net and informed them of the alumni’s existence. Aida is standing on the left-hand most of the photo. 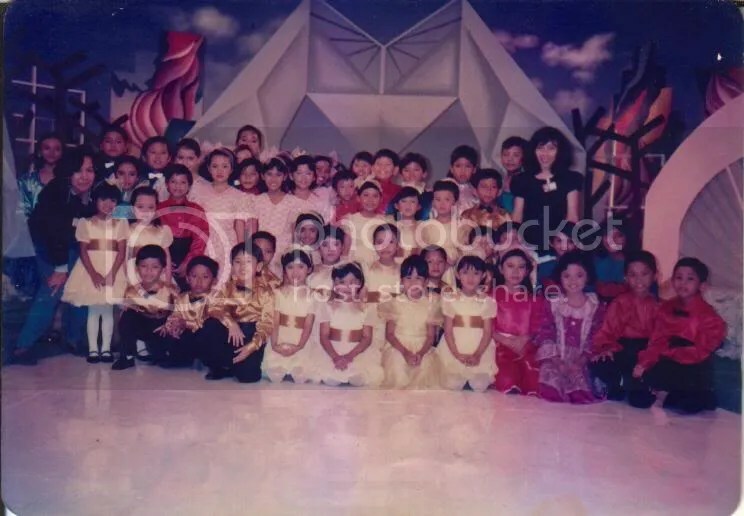 Can you spot people like Izzat (Soldadu), Fidiyana (Dian) and Suhaini (Newscaster)??? On 19th November, I was quite a busy man attending two events, the first was Hafeez Glamour‘s “Biol-Biol Raya” gathering at Ma Sin Thai Restaurant (the old Eden restaurant opposite Darul Ma’wa Children’s Home at Still Road) and later on in the evening, “Konsert Rahimah Rahim Kembali“. I thought of skipping Hafeez‘s event cos of my weekly football in the evening but then I thought I had already skipped the previous one he did back in July and I had given my promise that I would attend this one if he were to do it, so I kept my word. I had initial reservations about going too as attending it will result in me meeting some people I was having conflicts with. But in the spirit of Hari Raya and also thinking that life is too short to prolong bitterness, I went, hoping that they too would feel the same way as me, as it would only be so long that we can be at odds with one another. Not to mention, we were at odds over petty stuff I said on air and in some of my previous entries. So I told myself to just go with the flow. If people continued to hate my guts and honesty, then so be it. I cannot force others to like me for who I am. Due to unforseen circumstances, the event which was supposed to start at 3pm was moved to 2pm instead. Prior to that, I had 2 places to go, one was an open house and another was a baby’s shaving head (“Cukur Rambut“) ceremony. So you could imagine the rush I was in, driving like a speedster along the expressways and singing “Fast & Furious” to myself to speed up. I reached the venue just in time to see Hafeez coming in and starting the event. Datin Norish Karman who was supposed to attend did not turn up. No reasons were given and I only realised it when I am typing this entry. The event was slightly above average as the air-con was not working / or switched on to a higher temperature. I was practically perspiring and felt uneasy especially in my baju kurung that does not absorb perspiration. Entertainment-wise, I guess I’ve seen the same thing from the likes of Bibik Belacan and Mak Dara in the past but it was entertaining nonetheless. Khairil Yusof, Karisma and Iskandar Ismail (Eiss) did stellar jobs as well with their respective songs though Eiss could have done himself justice by wearing a more suitable outfit for the occasion. Only the Hip Hop group which performed a mish-mash of traditional and hip hop moves did not go down well with me as I felt they remixed too many songs and destroyed the essence of the Hari Raya mood by jumping from one genre to the other with no specific direction. It was a performance one would say “Ntah-apa-apa-ntah!!!“. To top it off, by the end of the event, I’ve buried the hatchet with the people I’ve had conflicts with. It was a big load off my chest when we apologised to one another and rekindled a broken friendship. I guess God answered my prayers to one day be at peace again with them even if the closeness would not be the same again. I am a forgiving person by nature, sometimes I feel it is my weakness. Whenever I forgive someone, I use a story in Rasulullah SAW‘s time as my guide. I’ve got to admit. I had planned to attend the “Konsert Rahimah Rahim Kembali” solely for the fact that Imran Ajmain was performing. Ever since I saw his performance at Sungguh Hot Finals in July 2004, I couldn’t get enough of the guy. 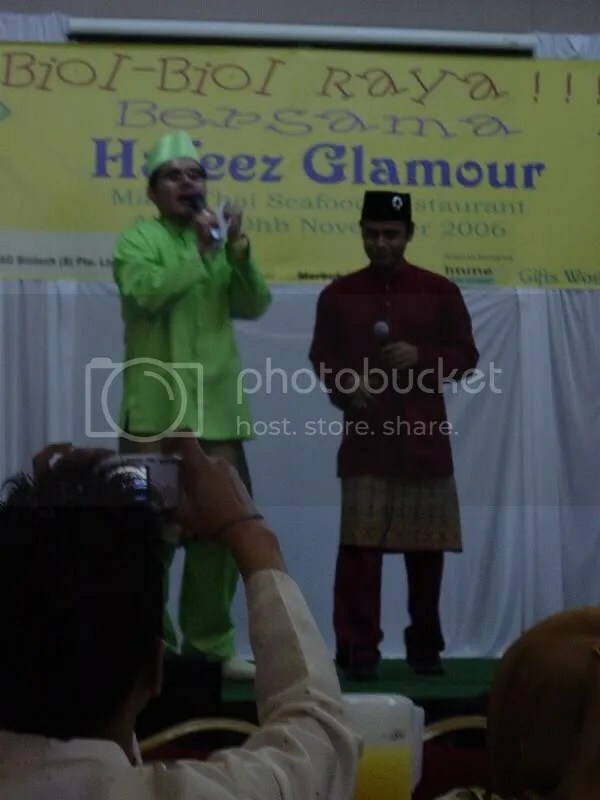 2005 was a bit of a lull period but since February 2006, I’ve been attending a few of his showcases namely the Hi-Tea With Hazami, the single launch for “Sudah Tu Sudah” and the Karnival Manja prior to Ramadhan just to name the high profile events. Fact remains, you can never get enough of the gentle giant’s soulful voice, which was why I was clamouring to attend the “Konsert Rahimah Rahim Kembali” just to see him sing at such a prestigious place as the Esplanade. The show kicked off at 8:05pm with “Kak Girl” (Rahimah‘s affectionate nickname) coming out in a black, shining costume and welcoming the audience with a medley of Hari Raya hits including her own cult favourite “Selamat Berhari Raya“. She then went into her element, speaking to different sections of the audience, exchanging banter and teasing them. She remarked that she had initially been stumped by the word “Kembali” in the title of her concert as the word could be construed in different ways, of which the one she feared most was returning to our Maker. But she made it sound so funny that everyone laughed. When she sang “Cabaran Cinta“, she took the time to introduce the 5-piece band that accompanied her. Led by the musical director Amy on keyboards and piano, the band included Yus on guitar, Rizal (drums), Irwan (percussionist) and Hendra (bassist). The latter, who sported an extravagant Mohawk hairstyle, is the grandson of famous award-winning composer Kassim Masdor. 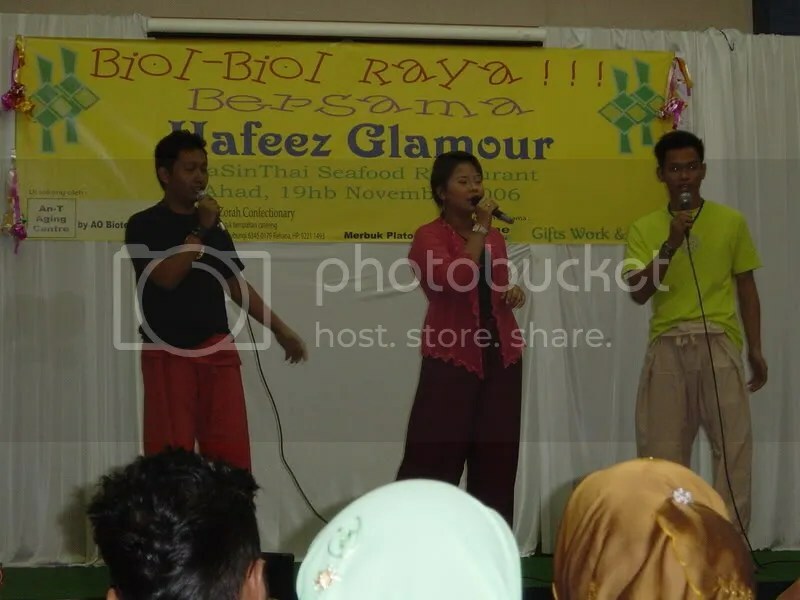 When she sang an old catchy English number, she introduced her back-up singers “Adam“, whose real name is actually Hamdan and was an Anugerah 2005 finalist and Kak Girl‘s famous other sibling Rozie Rahim. One thing I learnt being someone from the younger generation who did not watch that many Malay movies from the 80s-90s, is that one of Kak Girl‘s hits “Hati Yang Rapuh” was the theme song for the movie “Hati Bukan Kristal” which was produced in 1990 and starred Ridzuan Hashim, Erma Fatimah, Julia Rais and Shah Rezza. 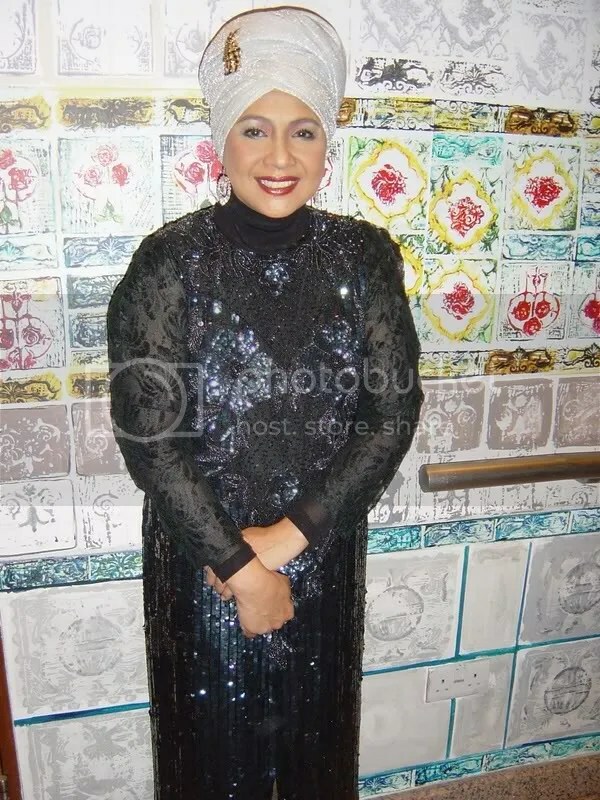 Later on in the show after she had taken a short break to allow Imran Ajmain and Syed Azmir their turns to shine, she also sang one of her songs which became the theme song for the hit drama series Adam & Hawa, “Masihkah Ada Cinta?“. 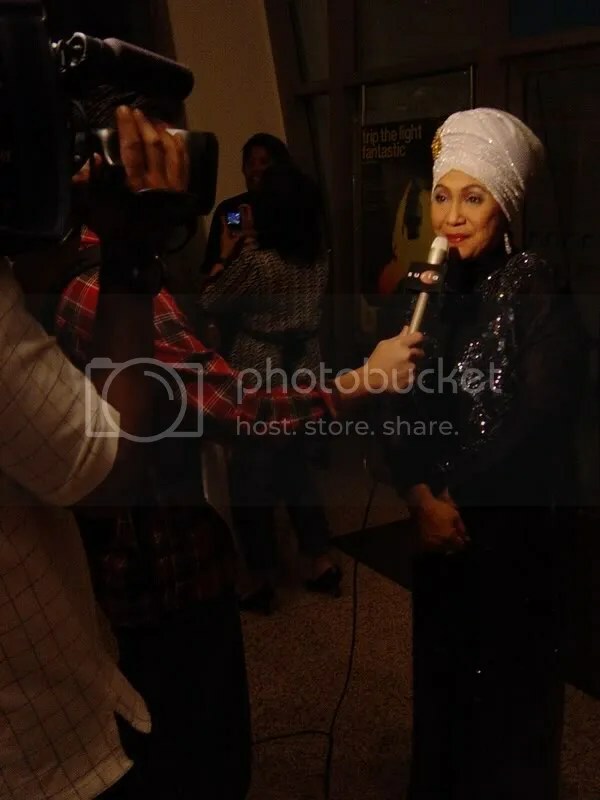 Before taking a break, she invited out Imran Ajmain and they did a duet found in her latest album entitled “Sejak Ku Bertemu“. She managed to joke that due to budget constraints, she couldn’t bring in the original duet partner, Nassier Wahab. But honestly the Pesta Raya series was to expose as many local acts as possible. Prior to the show, Imran had told me how nervous he was at having to sing the song, firstly cos he was singing with someone who is already a veteran in the scene and secondly he was not confident he could sing it as well. When he sang the first few lines, I could sensed where he was coming from as the song was quite low-pitched as compared to his renowned high-pitched vocals. But I think he pulled it off brilliantly. The initial nervousness slowly faded away as the song progressed. As I met him after the show, I told him his initial fears were unfounded. He didn’t say anything except to grin away. 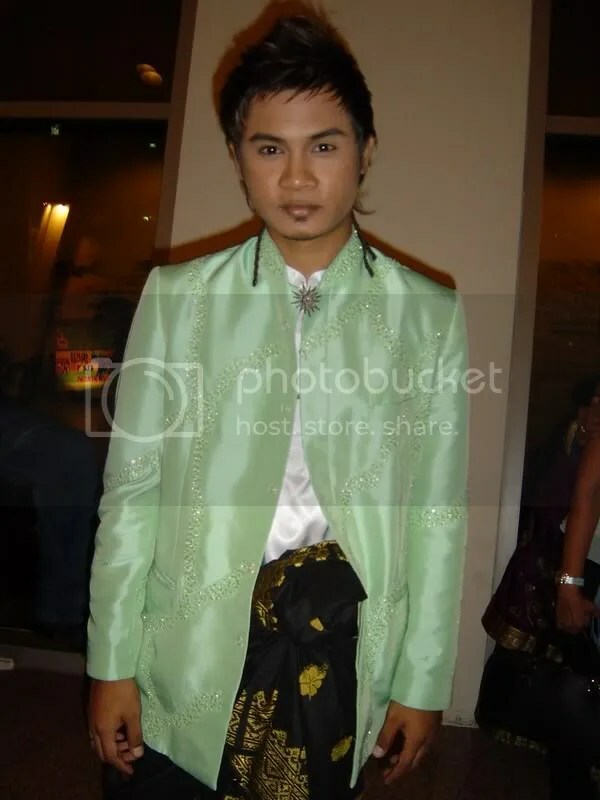 Once they got that song out of the way and “Kak Girl” made her way backstage, Imran took centrestage and mesmerised the audience with his massive current hit “Seribu Tahun“. Honestly for me, this song takes the cake as compared to his previous single releases “Sudah Tu Sudah“, “Ghaibmu” and the cover remake of “Apa Salah Beta?“. It is a beautiful love song, so simple, so pure, so pristine that when you listen to it, you can’t help but think of your loved ones. “Ghaibmu“, which Imran admitted was a difficult song to sing as he has to go into falsetto mode most of the time, followed and I’m sure he had captured the audience’s attention and hearts with his captivating voice by then. He rounded off his act by inviting Syed Azmir out and they did a duet on Sheila Majid‘s old Hari Raya hit “Hari Mulia“. I was expecting Syed Azmir to sing his singles “Tak Daya Menafi” or “Ku Sedari” but he ended up singing Samsons‘ haunting hit “Kenangan Terindah” and Khairil Johari Johar‘s “Sepasang Kurung Biru” instead. For the first song, I must say his performance was flawless. It sounded as though I was listening to the original singer. 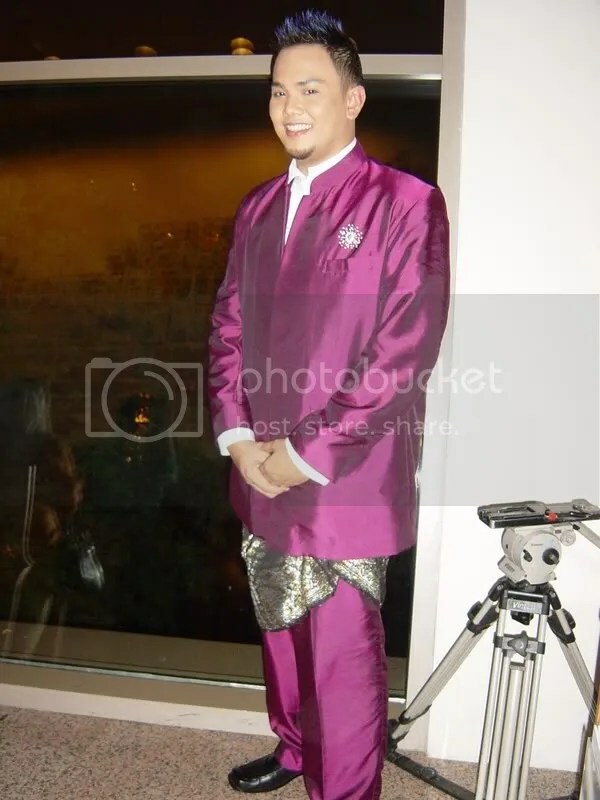 However his interpretation of “Sepasang Kurung Biru” didn’t leave much of an impression in me. I thought it sounded draggy and off-key at times. But to be fair, he was just giving it an R&B touch to the song, which did not turn out as good as I expected as it lacked feel and the sadness associated to it. “Kak Girl” then came back on stage and did a short interview with Syed Azmir, in which he said he would be releasing in December. Seems like there’s an avalanche of R&B princes’ album launchings lately – Taufik Batisah, Hady Mirza, Imran Ajmain sometime this week or next week, and followed by Syed Azmir next month. It’s a healthy competition but I hope the competition doesn’t get too saturated as there’s only so much R&B the listening audience can take in. But honestly if you ask me who amongst the four gets my vote, then I’m putting my head on the block for Imran. I hear sounds of “Why Imran?? ?” The answer is simple. If you can sing a traditional song in its pure form, you can sing any song thrown at you. Also, with every performance, Imran always improvises his songs and does not make it sound as though you are listening directly from his tracks. He reminds me of Siti Nurhaliza in that sense. If you guys listen to Siti‘s albums and watch her concerts, you will know that she loves to improvise her rhythms and vocals. I see all of that in Imran. Granted he might be a bit on the heavy side but I guess if you are a lover of music more than the whole package, it is the voice that stands out amongst the lot. And he most definitely has my vote. “Kak Girl” began her second set with another Hari Raya song entitled “Bersua Di Hari Raya“. It sounded alien to me as it was the first time I heard it but it was a nice song nonetheless. After the song she gave credit to the lyricist – Hafeez Glamour. No wonder when I heard the lyrics it sounded sad, about being away from loved ones. Hafeez‘s parents are residing in Negeri Sembilan so the mood of the song somehow captured his emotions. After singing “Masih Ada Cinta“, and “Doa“, “Kak Girl” rounded off her night with a medley of hits “Jika Begini“, “Cintamu“, “Gadis & Bunga” & “Ku Ingin Bebas“. And finally, the moment you’ve all been waiting for… Aida has finally given birth this morning at 9:15am to our firstborn, our daughter who goes by the name of Syahindah Adawiyah (Pious & Healer). Both mother and daughter are doing well, the mother feeling weak as she went through the C-section due to the aforementioned cord round the baby’s neck and for the fact that the baby’s head was big. Alhamdulillah all went well, save for the fact that my mum wasn’t able to share the joy of seeing her first grandchild as she fell ill all of a sudden. I just hope she would get well as soon as possible as she is due to go for Hajj this Sunday. As you can see from the picture, my daughter does not have any resemblance of me nor my wife, maybe not yet. Even when I first saw her, I had to ask the nurse if she was my daughter since she looks like a Japanese kid and I had to make sure I was giving the call for prayer to the right baby. When the nurse carried her and put her in my arms, she started to cry but when I started the call for prayer, she kept quiet and listened intently. It helps that she’s had practice by going umrah and fasting for 29 days (yes her mother almost got to fast in full, save for the last day when she fell ill) in her mother’s womb. Throughout the day, whenever I carried her and sang to her solawat and tasbih, she kept quiet in my arms. I pray that she grows up to live up to her name. I can’t wait to bring her up!!! Congrats bro! We are all so excited especially my hubby.. all the way to the hospital saying, “Quick! I can’t wait to meet my daughter!” Take good care of Aida and our princess ya.. Our ‘Raja’ will be out soon joining her! To Aida, have a speedy recovery. Hey,Congrats to u n wifey. See that your wife gets extra everything since she’s a C sec(seriously, I wld opt for a vaginal birth anytime, having to go thru a C sec once myself) as the recuperating period for a C sec is longer and at most times more painful than a normal birth. Coax her to drink plenty of pati ikan haruan, it’ll help speed the healing of the wound. And no carrying of heavy stuff, period. Speedy recovery to Aida and congrats again to both of you. Congratulations… to u and wife!! BABY INDAHHH!!! OMG I GOT TO SEE UUUUU!! 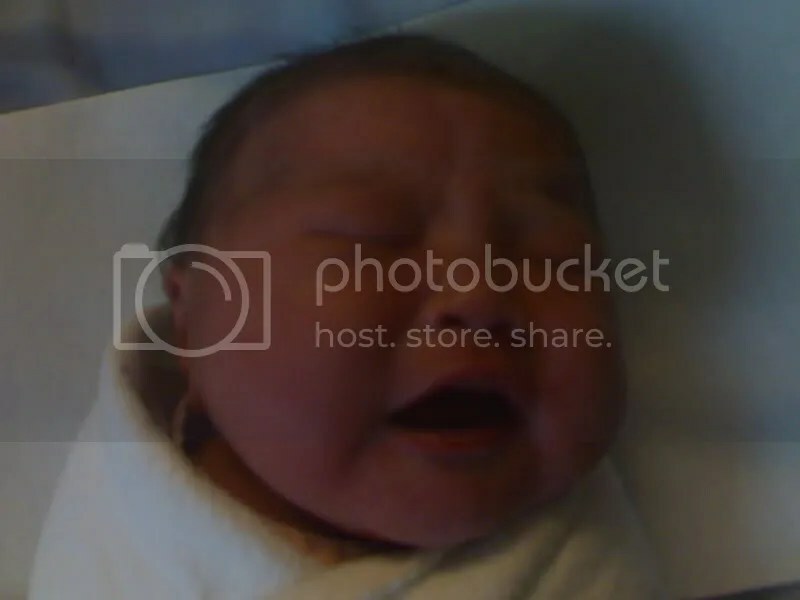 WELCOME TO THE WORLD, BABY INDAHHH.. kehkhekheke.. ur face very the tembam… like me oso… lmao! Alhamdulliah.. Congratulations to u and ur wife on the arrival of your baby princess… Syahindah Adawiyah..
May ur wife have a speedy recovery!! My prayers with her..
selamat ya! good luck to be a dad!